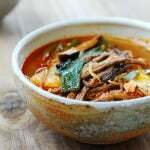 This chicken soup is a simple and easy version of dakgaejang (닭개장), which is a chicken variation of yukgaejang (육개장), a hearty, spicy beef soup. I love it because the recipe calls for minimal ingredients and takes less than 30 minutes from start to finish! Still flavorful and satisfying! 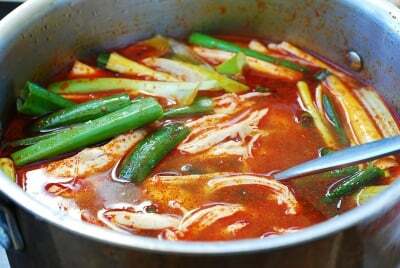 Typically, dakgaejang is made with a whole chicken and lots of scallions and other vegetables such as gosari (fernbrake fiddleheads), bean sprouts, and mushrooms. 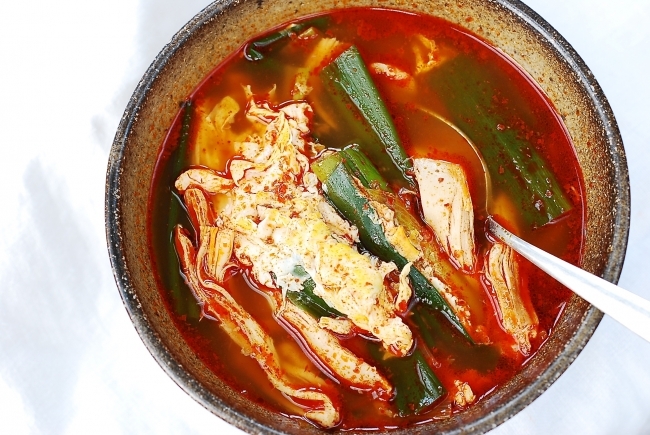 In the past, I showed you how to make dakgaejang with leftovers of a roasted whole chicken or turkey, using the stock made with leftover bones. 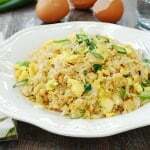 This recipe has two main ingredients — chicken breast and scallions. The chicken can have the skin and bones. You can use chicken thighs as well. To keep the chicken tender and moist, I cook the chicken over relatively low heat. It only takes about 10 minutes to cook, and the resulting broth is nice and refreshing! Since the scallion is the only vegetable in the soup, use lots of them! The large variety of scallions (daepa, 대파) is generally preferred for soups if you can find them. They are more flavorful! Lately, I’ve been able to find them in Korean markets around here. If you want, you can always throw in some mung bean sprouts (sukju namul, 숙주나물) and/or mushrooms. 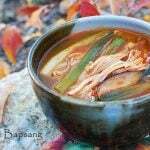 Dakgaejang is a summer favorite in Korea as a nourishing soup that boosts the energy level during hot summer days, but this hearty, comforting soup is great all year long! Not to mention weeknight friendly! 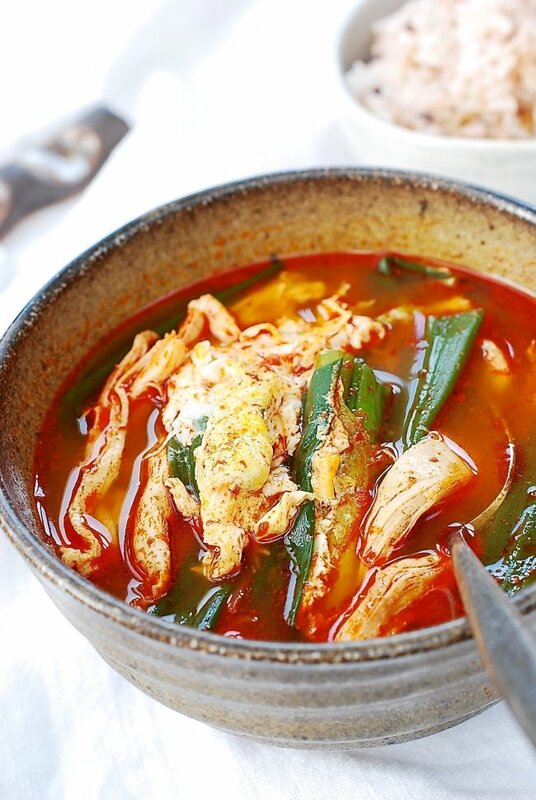 A simple and easy spicy chicken soup with scallions! Add the chicken breast, onion, scallion, and garlic to a medium size pot along with 5 cups of water. Bring it to a boil over high heat. Reduce the heat to medium low. Cover, and continue to boil for about 7 to 8 minutes. 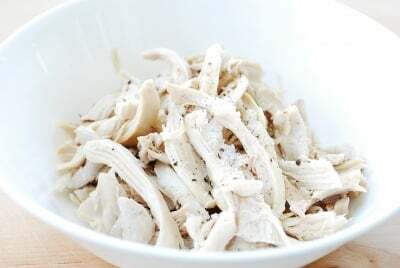 Turn the heat off and remove the chicken to a bowl. Strain the broth into another bowl, remove any visible fat and discard the aromatic vegetables. When cool enough to handle, remove the skin and bones if any, shred the chicken and season with salt and pepper. In the same pot, heat the sesame oil until hot (but not smoking hot) over low heat. Add the chili pepper flakes and turn the heat off. Stir gently until the oil turns red and the chili pepper flakes become pasty. Do not burn the flakes. Mix in the soup soy sauce and garlic. Add the broth to the pot, and bring it to a boil. Add the meat and scallions into the stock. Continue to boil for an additional 3 – 4 minutes. Add salt and pepper to taste. Gently drizzle the egg over the soup before turning off the heat. Do not stir. Serve with a bowl of rice. What do you mean by soup soy sauce? 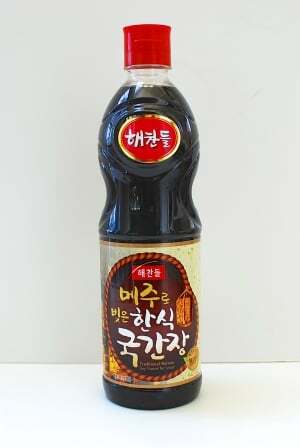 It’s Korean traditional soy sauce made as a byproduct of making doenjang (soybean paste).It’s lighter in color but has a deep flavor. I’ve linked to a photo of it. Your recipes are just amazing… I think I was born into the wrong nationality! I should have been born Korean! Ha ha Sharon — I’m glad you like Korean food! Thanks for the kind words! 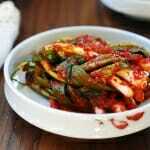 You are making wonderful recipes for those of us interested in real Korean food. In general is there a way to lessen the heat after this dish is prepared? Some of my family would like it less spicy. What could be added without harming the flavor of the soup? 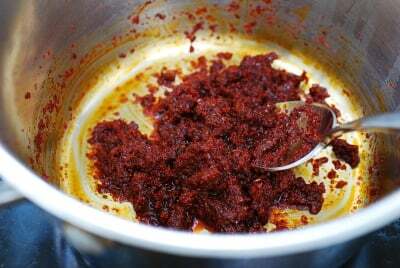 Or does one just lessen the amount of the spicy ingredients? Thank you, Steve! yes, just use less gochugaru to make it mild. Can you make this in a slow cooker? If so, how would you change the recipe? Ps. I love your recipes!! It looks like you’re using more than 1 tablespoon of red pepper flakes in the picture on step 3 so I added an additional tablespoon of red pepper flakes and the dish still has no flavor. How much gochugaru did you use? The amount of gochugaru mostly determines the spicy level. If the soup had no flavor, you probably needed more salt, which will bring out the flavor. I like yookgaejang but it’s definitely not something I would try to make on a whim, but this was delicious! I did add quite a bit of salt to get the flavor to come out nicely. I shared this recipe with some korean friends and they are doubtful it can taste that good with such minimal ingredients so I’m curious what they think when they make it! Thank you! They will like it as much as you do — I hope! Thanks for coming by and leaving me a note. Really appreciate it. hmmm… 14 cups? The recipe calls for 5 cups of water. My husband rarely experiences flu-symptoms, and usually doesn’t like soup; however, since he craved for some, I checked out this recipe. I haven’t been able to find gosari (fernbrake fiddleheads) in Flagstaff, and my husband’s not a fan of bean sprouts, so I added shiitake mushrooms and his favorite vegetable, baby bok choy. I added more red pepper flakes since we both love our spicy foods with an extra kick, but followed everything else as stated. 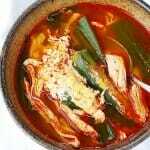 Thank you so much Ms. Hyosun for this refreshingly delicious soup recipe! Aww nice! Love to hear you made adjustments to the recipe to make it work for you. And thank you so much for all the wonderful words and wishes! Happy New Year to you and your family as well!